Daughter of a soldier who served in the Gordon Highlanders now in retirement and living on pension. Whilst at Forres Academy she revealed outstanding musical talent. Accepted by the Royal Scottish Academy of Music and Drama where she studied with the aid of a grant from the Lord Kitchener Memorial Fund. Son of Royal Air Force pilot totally disabled in a flying accident. Duke of Edinburgh's Gold Award at school. Had early vocation for medicine and studied at Liverpool University Medical School with the assistance of a Kitchener Scholarship. During his time at University he was prominent in organising activities to raise money for medical charities. Son of a Royal Navy veteran who is now an invalid and unemployed. School career affected to some extent by domestic problems and the need for part-time employment but won through to obtain a place at Liverpool University. Studied medical biochemistry with help from Lord Kitchener National Memorial Fund. Army officer's daughter - an Oxford graduate - and the first woman to be awarded a Kitchener European Scholarship. Worked in international banking in London and Paris before embarking on an MBA degree course at Fontainebleau 'with the invaluable help of the Kitchener Fund'. Returned to work in the City. Son of a naval officer. Joined the army shortly after leaving school and served for 8 years as an officer in R.E.M.E. With the help of a Kitchener Fund award he decided to pursue an MBA course at INSEAD in preparation for return to civilian life and considered the years there 'was one of the most worthwile of my life'. Worked as a stock analyst in the City 'after finding that many industrial companies put a high value on analytical experience'. 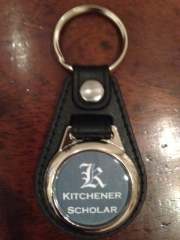 Please add secretary@kitchenerscholars.org to your safe senders list to ensure you receive our newsletters.